Play your videos on a Chromecast or Smart TVs. Tested with some Sony and Samsung recent models. Create a DLNA server for Smart TVs. 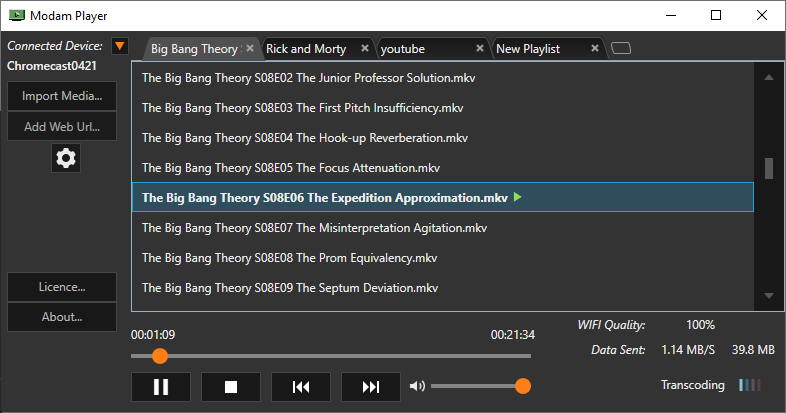 Create playlists easily by importing your media files. The currently supported format are mkv, mp4 and avi files. The preferred video codec is H.264 and the audio codec is AAC. A really intuitive UI that makes it easy to stream your videos. Support other video formats: .mpeg, .ts, .mov, .flv, .m4v, .wmv, .webm. Support youtube videos natively from Chromecast and Samsung TVs. Add thumbnail for each video. View video preview when hovering on the timeline. Show the next video to be played next. Create channels view. Automatic creation of playlists. Improve video transcoding performance using GPU. Add an update button for downloading the latest Modam Player version.